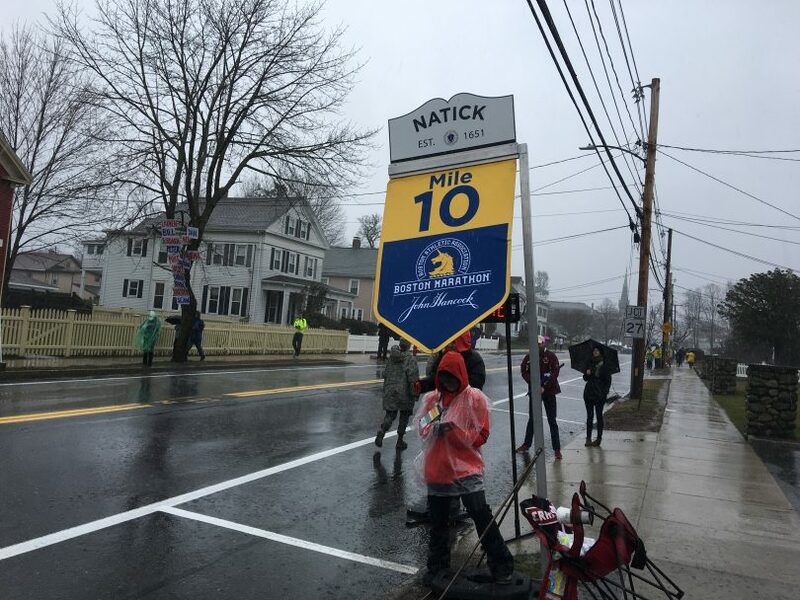 Natick is on the Boston Marathon’s 10th to 12th mile, where it goes uphill toward Wellesley. 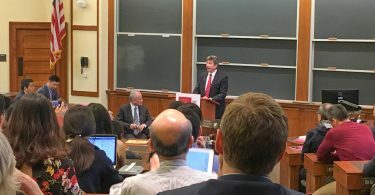 Photo by Dave Sebastian/BU News Service. NATICK, Mass. — Even as the morning drizzles grew into an afternoon downfall, spectators along the East Central Street unflinchingly cheered for the runners braving through their 10th and 11th miles of the race. For spectators like Natick resident Cindy Turkington, it was the wettest Marathon Monday they have seen in years. Wind and temperatures in the mid-30s prevailed over the race, but some spectators came in anticipation of such weather. Brandin Tumeinski, 36, of Westborough, was already by the Morse Institute Library building at about 8:30 a.m. with his daughter, Emerson, nestled in a mini-tent. Music, both from loudspeakers and from live performers, also serenaded the marathon. Trevor Singleton, 43, of Framingham, brought his drums to an East Central Street home’s porch and complemented the crowd’s screams with his beats. He said he first played on that porch for the Marathon 11 years ago, when he was a tenant at that house. Bobbi Lane flew from Pleasantville, Utah, to support 17 of her Utah runner friends. Sitting on a portable chair in a black raincoat, Lane said she has run 20 half marathons and is slated to run the Walt Disney World Marathon in Orlando next January — her first marathon. “This is to inspire me,” she said of the Boston Marathon. 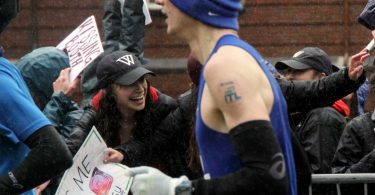 Alongside some marathoners who run with only a thin layer of clothing, or even shirtless, several spectators were also underdressed for the rain. Sporting a blue hoodie and an Irish flag draped on the front — sans umbrella or poncho — Lesley Kenny rooted for her marathoner sister, Eva Kenny, while also occasionally helping other marathoners who were in need of hydration. But amid the rainy-day hurrah, approximately 2,300 Boston Marathon runners received medical treatment today, with many suffering from hypothermia, the Boston Globe reported. Christopher Besse, a spokesman for the Massachusetts Emergency Management Agency, told the Boston Globe that several warming centers were opened in Brookline, Newton, Natick and Wellesley. Several runners were seen exiting the route on East Central Street to either take breaks or to leave the race.